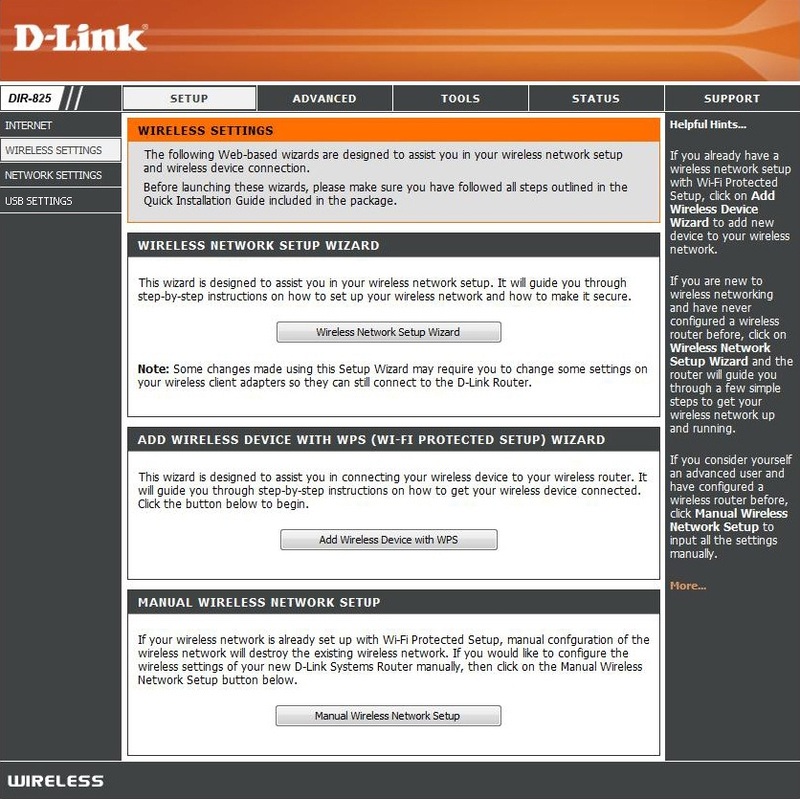 To run the security wizard, click on Setup at the top and then click Launch Wireless Security Setup Wizard.This article in D-Link DIR-825 as an example. Check the Manually set 5GHz band Network Name… box to manually set your desired wireless network name for the 5GHz band. 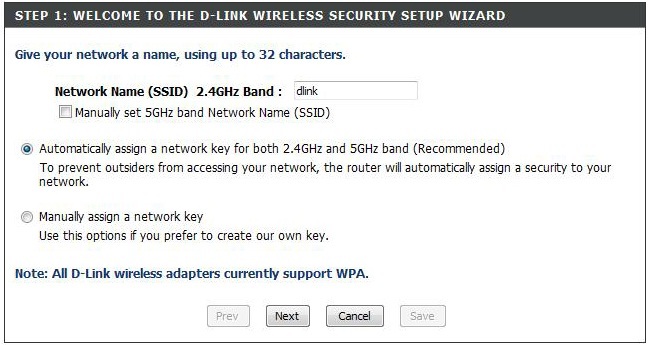 Automatically: Select this option to automatically generate the D-Link router’s network key and click Next. Manually: Select this option to manually enter your network key and click Next. If you selected Automatically, the summary window will display your settings. 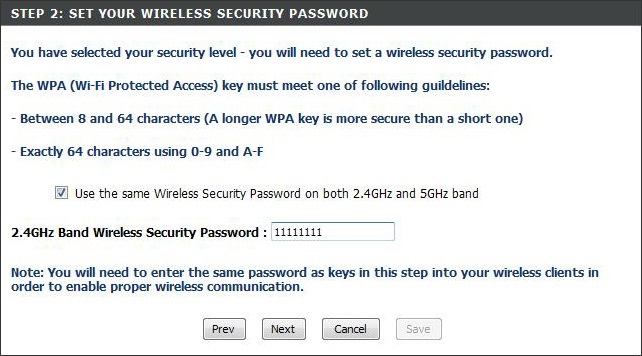 Write down the security key and enter this on your wireless clients. Click Save to save your settings. From the Setup > Wireless Settings screen, click Add Wireless Device with WPS. 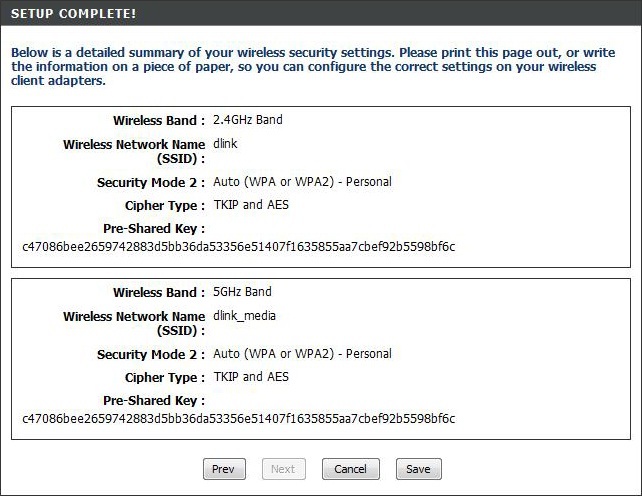 Select Auto to add a wireless client using WPS (Wi-Fi Protected Setup). Once you select Auto and click Connect, you will have a 120 second time limit to apply the settings to your wireless client(s) and successfully establish a connection. PIN: Select this option to use PIN method. In order to use this method you must know the wireless client’s 8 digit PIN and click Connect. PBC: Select this option to use PBC (Push Button) method to add a wireless client. Click Connect. WISH is short for Wireless Intelligent Stream Handling, a technology developed to enhance your experience of using a wireless network by prioritizing the traffic of different applications. Enable this option if you want to allow WISH to prioritize your traffic. When enabled, this option causes the router to automatically attempt to prioritize traffic streams that it doesn’t otherwise recognize, based on the behaviour that the streams exhibit. This acts to deprioritize streams that exhibit bulk transfer characteristics, such as file transfers, while leaving interactive traffic, such as gaming or VoIP, running at a normal priority. A WISH Rule identifies a specific message flow and assigns a priority to that flow. For most applications, the priority classifiers ensure the right priorities and specific WISH Rules are not required. WISH supports overlaps between rules. If more than one rule matches for a specific message flow, the rule with the highest priority will be used. The rule applies to a flow of messages for which one computer’s IP address falls within the range set here. Host Port Range:The rule applies to a flow of messages for which host’s port number is within the range set here. The QoS Engine option helps improve your network gaming performance by prioritizing applications. By default the QoS Engine settings are disabled and application priority is not classified automatically. This option is disabled by default. Enable this option for better performance and experience with online games and other interactive applications, such as VoIP. This option is enabled by default when the QoS Engine option is enabled. This option will allow your router to automatically determine the uplink speed of your Internet connection. This displays the detected uplink speed. The speed at which data can be transferred from the D-Link router DIR-825 to your ISP. This is determined by your ISP. ISP’s often speed as a download/upload pair. For example, 1.5Mbits/284Kbits. Using this example, you would enter 284. Alternatively you can test your uplink speed with a service such as www.dslreports.com. 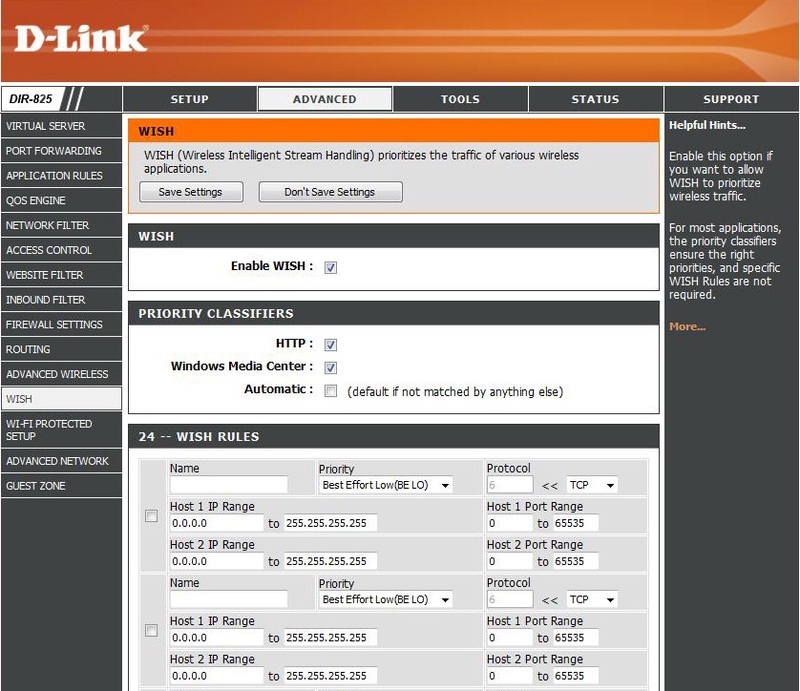 By default, the D-Link router automatically determines whether the underlying connection is an xDSL/Frame-relay network or some other connection type (such as cable modem or Ethernet), and it displays the result as Detected xDSL or Frame Relay Network. If you have an unusual network connection in which you are actually connected via xDSL but for which you configure either “Static” or “DHCP” in the Internet settings, setting this option to xDSL or Other Frame Relay Network ensures that the router will recognize that it needs to shape traffic slightly differently in order to give the best performance. Choosing xDSL or Other Frame Relay Network causes the measured uplink speed to be reported slightly lower than before on such connections, but gives much better results. When Connection Type is set to automatic, the automatically detected connection type is displayed here. This option is enabled by default. 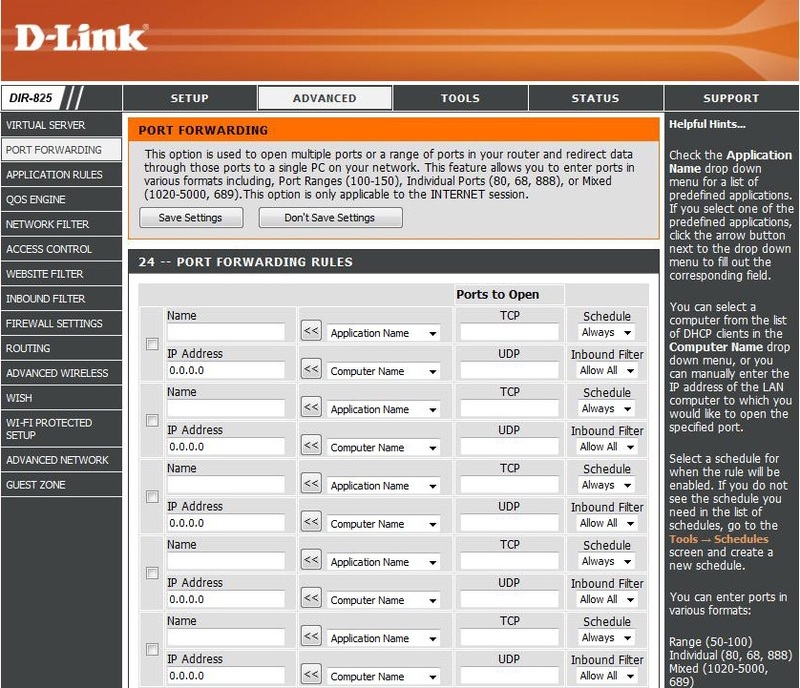 This will allow your D-Link router DIR-825 to automatically determine the network priority of running programs. This option should be enabled when you have a slow Internet uplink. It helps to reduce the impact that large low priority network packets can have on more urgent ones.